Choosing the right color for your fixtures is an important decision to make when remodeling a kitchen or bath. Chrome fixtures once dominated the design preferences of professionals, only to be replaced by brushed nickel, brass, and even gold. Nowadays, however, designers are falling head over heels over matte black finishes that can be found throughout the house. While black can pop up anywhere, the trend to matte black is appearing mainly in the kitchen and bath. Here are just a few ideas of how you can introduce this hot trend into your home. A black kitchen sink makes a bold statement regardless of its size or shape. A daring addition to any décor, the matte black sink adds a touch of elegance and charm even with a farmhouse sink. Check out Pinterest or Google “matte black kitchen sink” to gather some ideas. What about black paint? Believe it or not, black can be applied as an accent color in a small space like a bathroom. Black is incredibly versatile and can go with any other color. Sherwin-Williams offers two popular black paint options that are edgy and elegant at the same time: Caviar SW 6990 and Tricorn Black SW 6258. Bathroom Faucets. For so many years chrome was the dominant color for bathroom faucets; yet the color often fades into the background. A matte black faucet, on the other hand, always makes a bold statement. 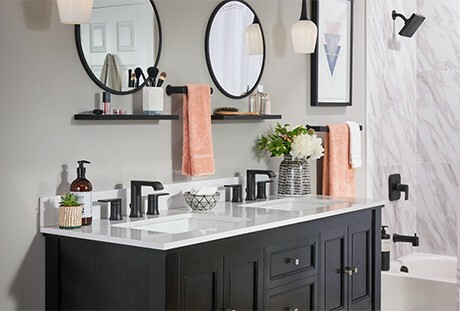 Moen, Delta and Kohler all offer both modern and traditional styles. Black plumbing fixtures are especially dramatic when paired with white bathrooms. A black showerhead against marble or a white subway tile is a match made in heaven. Now here’s the really good news: you don’t have to go through a major renovation to update your bathroom or kitchen. If you’re on a tight budget, just switching out your fixtures can have a huge impact on your bathroom or kitchen. We have an entire division in our company dedicated to handling remodeling for our customers. Before you hire a contractor, think about how much faster and more efficient your remodeling will go when working with only one supplier. No need for a contractor to coordinate with sub-contractors who have too many jobs already. The Plumbing Source’s own staff will handle your project from start to finish. So put us on your list of companies to consider when planning a kitchen, bath or basement renovation. And call us for help upgrading your existing bathroom or kitchen with new faucets from America’s top suppliers. You’ll love what we can do with your bathroom or kitchen! When you call The Plumbing Source, you’ve made the RIGHT call!